Slack variables are defined to transform an inequality expression into an equality expression with an added slack variable. The slack variable is defined by setting a lower bound of zero (>0). In APMonitor Modeling Language, inequality constraints are automatically translated into equality constraints with slack variables. Slack variables can also be defined by starting a variable name with slk. When the model is parsed at run-time, any variable beginning with slk is automatically assigned a lower value of zero. 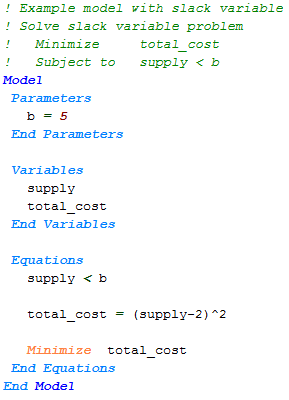 Alternatively, inequality constraints will be automatically converted to equality constraints with a slack variable. Slack variables are also useful for optimization problems with non-smooth or discontinuous functions. The following tutorial demonstrates the use of slack variables in reformulating the ABS() function, IF statements, and others.